Since 1984, the Ordes companies have been working with only the highest principles of craftsmanship and material. With the aid of our high skilled Project Managers, our certified electricians see to your projects from bid to completion. Our electricians are equipped with radios and cell phones to provide 24 hour service and emergency service. They are trained and capable of dealing with the most demanding and complex troubleshooting of electrical problems, as well as implementing preventative electrical maintenance for building systems. We pride ourselves on quality workmanship and timely delivery. We’ve constructed our company on our dedication to customers and their electrical needs. Our goal is to convey first class, on schedule, and in-budget projects to all our customers. 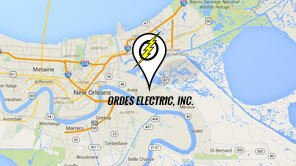 The Ordes companies are very strong financially based and are fully insured. Our state licenses include Louisiana and Mississippi.